The Vita is, generally speaking, a good portable gaming device. For more detailed thoughts on it, check out Stephen's review from 2012. Last week Sony sent us a Vita Slim to review, and I've been messing around with it since then. Given that I already play a lot of Vita games, a week has been enough to give me a pretty solid impression of how the new handheld stacks up with the old one. If you've been paying close attention to the Slim, you've probably already read a bunch of impressions and reviews, given that the Vita Slim has been available in other territories than North America for a long time now. The new Slim costs $200 and comes in a bundle with an 8GB memory card and a digital voucher for Borderlands 2, a well-liked 2012 shooter that now been ported to the handheld system. From a distance, the Vita Slim looks more or less the same as the original Vita. It's black and oblong, with two thumbsticks, a directional pad, four face buttons, and two shoulder buttons. It's when you pick the thing up that you really notice the difference—it's much lighter than its predecessor. It feels more hollow and more like plastic, which does lend the device a certain feeling of cheapness when compared with its chunkier forebear. That feeling of lightness initially put me off the Slim, but as I used it I came to prefer how it feels and how it sits in my hands. The Slim is indeed slimmer than the original Vita, and as a result my fingers curl around it in a more natural way. My fingers rarely slip onto the rear touchpad in the way they still do on the original Vita, and my thumbs feel a touch more comfortable during long periods of play. Here's where we get granular: While the two handhelds are very similar, some other small differences become apparent at when you get in close. For starters, the buttons on the Slim are generally better placed and easier to use than their counterparts on the original. The Select and Start buttons, in particular, are much bigger and are circular, which makes it possible to hit Start without relying on the corner of your thumb to press the button. It's also much easier to grab screenshots using the PS Button + Start combo, since both buttons are so much easier to press. Another couple small improvements worth noting: The charging cable is now a micro-USB connection, meaning that you can charge the Vita with more of a variety of cables. It's also just easier to use and plug in than the big, weird cable that plugs into the original Vita. The Slim also comes with 1GB of built-in memory, though that's really not enough room for very much software. Fortunately the system's launch bundle includes an 8GB memory card; it's the second-smallest one Sony makes, but still enough to download a couple big games and some smaller indies. Wireless connectivity still isn't amazing, but it's essentially unchanged from the original Vita. I was bummed that the Bluetooth functionality hasn't been improved in the Slim—I use a bluetooth headset for gaming when I can, but while my headset has no problems with most devices, any time I pair it either Vita I get constant interruptions whenever I move the device around. That was true of the old Vita, and it's still true of the new one. The Vita's gorgeous screen has always been one of its biggest selling points. And there's really no two ways about it: The LCD screen on the Vita Slim is noticeably less crisp and bright than the OLED on the original Vita. It's difficult to capture in a video, but immediately noticeable when you place the two systems side by side—the original Vita's screen has a distinctive pop to it, a way that the game's visuals seem to be right there at the top of the screen, rather than within it. The Slim's screen just looks like another handheld video game console screen. That criticism comes with the usual disclaimer, however—if I weren't placing the two Vitas side by side, I doubt I'd notice. The new LCD screen can't compete with, say, the retina screens on an iPhone or iPad, but it's far from ugly. Pretty Vita games like Killzone Mercenary and Persona 4 Golden still look good. However, the fact remains that the screen on the new model is noticeably inferior to the screen on the older one. I am a dreamer; I'm a pie-in-the-sky guy who wants the impossible. But damn it, I want what I want! 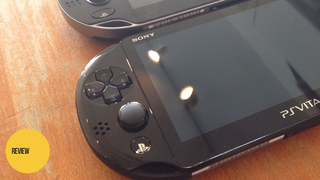 And because I love the idea of PS4 game streaming, I want the Vita to have four shoulder buttons, not two. The Vita's promise as a PS4-streaming handheld device is so cool… except that the lack of a second set of shoulder buttons makes most games a nuisance to play. I understand why Sony wouldn't want to create a hardware disparity between its two models, but I can't help but wish they'd thrown caution to the wind and done it anyway. I could live with the lack of clickable thumbsticks (the touchscreen would work for those) if there could just be some little nubs behind the main shoulder buttons, something to approximate L1 and R1. There isn't, and the Vita Slim doesn't add any new buttons or any other hardware improvements to make PS4 remote play work any better. That's a shame, because I really want to use PS4 remote play, and I still mostly avoid it because I don't like how the Vita compensates for the missing buttons. An observation: I sure have been playing a lot of Vita games lately. My handheld gaming habits go through phases—for about six months last year I played almost exclusively on 3DS, and I've also gone through phases where I play everything on iOS devices. But right around when I ran out of gas on Bravely Default, I switched over to Danganronpa on Vita and haven't looked back. These days I'm steadily playing a combination of Fez, Spelunky, Luftrausers, Final Fantasy X, Stealth Inc., and Lone Survivor, all on Vita. I've also been playing through the new ports of God of War Collection and Borderlands 2. (More thoughts on those games soon.) And that's not to mention the PSP games I come back to in fits and starts, primarily Trails in the Sky and Final Fantasy Tactics. All of which is to say that there are more good games for the Vita than ever before. The Vita Slim improves on the original Vita in several small ways—buttons, plugs, included memory, ease of use, lighter weight. It also brings one notable downgrade—the less brilliant screen. In the end, it's important to step away from the constant comparisons and survey the black device on the table in front of me. There it is: A pretty cool, relatively expensive gaming handheld with a big screen, two thumbsticks, a good d-pad, a few notable flaws, and an ever-more-solid collection of fun games. In other words, what once was a Vita remains a Vita, though now it'll be a bit easier to carry around.